An interesting chart. But something is missing. The term “paranormal” refers to experiences that are considered to lie outside the range of normal experience or scientific explanation. So beliefs in the paranormal could include belief in material beings such as space aliens and maybe even werewolves. No mind-body dualism is necessary. 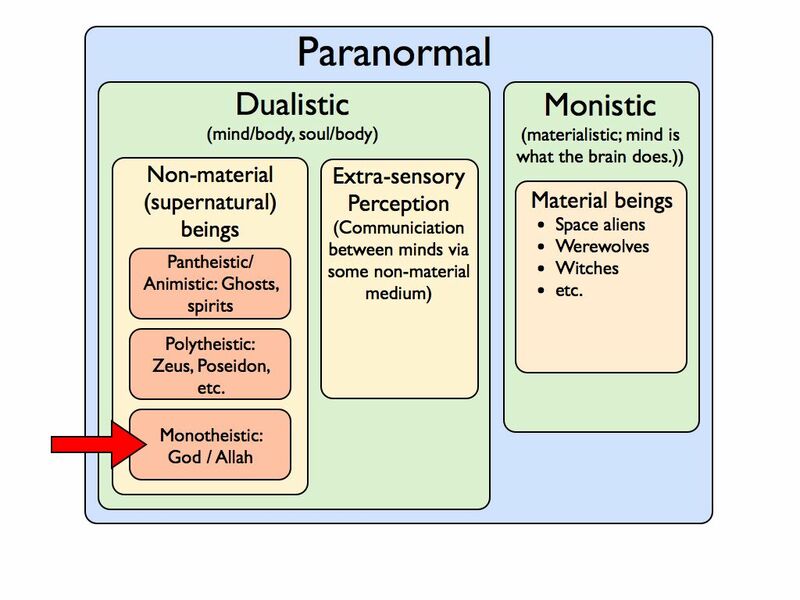 However, most paranormal experiences involve dualism—body on the one hand and mind/soul/spirit on the other. Within the set of beliefs requiring dualism lie two subsets—belief in non-material, or supernatural, beings and belief in communication between minds via some ethereal medium (ESP). The missing category on the chart (above) lies in the “non-material beings” subset, as shown below. Clearly, we cannot include beings of a pantheistic or animistic nature (and origin) without also including the ones from monotheistic and polytheistic traditions.